In our last post, we talked about how to turn your Cook shed into the place for the gardener in your home! You can either go all out and turn your Cook Portable Warehouse into the perfect greenhouse, or utilize it as a Garden Shed. If you decide to make your portable building into the space that houses all those important gardening supplies, gear, materials and more, you have to be organized! Keeping a tidy and ordered space will cut down on the time spent looking for items and increase time spent doing what gardeners love to do! When you have fresh flowers brightening up your home or homemade vegetables for dinner, it will be time well spent! Before spring begins is the perfect time to get your organization system in place! Here are 9 out-of-the-box ideas for your Garden Shed. Don’t forget vertical space- Think about those big items like rakes, shovels and wheelbarrows that take up a ton of floor space. If you can, use the sidewall space in your shed and hang those larger items using racks, hooks or PVC pipe. Keep it easy with long handle tools by adding a piece of knotted rope to make a handle. Use magnetic strips- One of the tried and true organizing tips is to use cheap and easy-to-install magnetic stripes. Attach one or more to the wall to hold small scissors, spades, pruning shears and claws. Just make sure it can hold the amount of weight necessary. Get creative with shelving- Shelves aren’t always the same and can come in many different varieties. For example, turn an old wooden bookcase on its side and make it into a place for tools, gardening gloves and your watering can. Have one high shelf- It’s a smart idea to have at least one horizontal shelf attached high-up on a wall. This is the place for fertilizers, chemicals, weed killers, bug sprays and other potentially harmful supplies. Be inventive with hose storage- There isn’t anything more frustrating than trying to find and untangle your garden hose before getting to work. Hang a medium-sized metal bucket and wrap your garden hose around the outside. This will help prevent tangles and potential damage. Keep seed packets together- Those small packets of seeds or dried flowers/herbs can easily get lost in your shed. Keep them together with a coupon book, jewelry organizer or small craft boxes. Utilize movable bins- Invest in a few clear bins with a lid and rollers. These are great to store and use potting soil on-the-go. 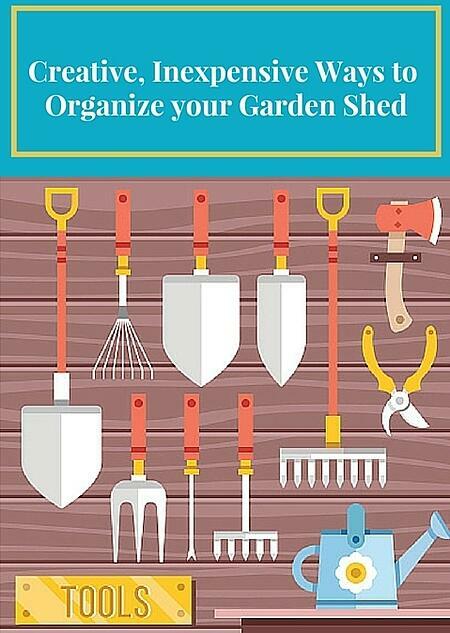 Be functional and fashionable- Think about the decor of your shed while you are organizing it. For example, paint some inexpensive clay pots in your favorite accent color and use them to store small hand tools. Be welcoming- To keep your Garden Shed clean and make sure all that dirt and soil stays out, invest in a welcome mat. Choose a color and style that matches the exterior look and interior design of your shed. Want to learn more about why Cook Portable Warehouses exceeds other portable storage companies? Read more about the Cook Differences by clicking below!